Everyone loves a trip to the beach! 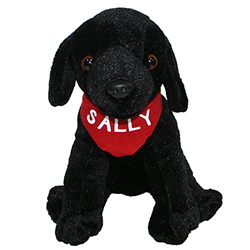 Sally, a spirited black Labrador, sure does. When she arrives, she encounters new friends, new smells, new games, and, best of all, new adventures. Told from the dog's point of view and brought to life through charming and brightly colored woodcut prints, this endearing story of Sally's vacation is the perfect companion to a child's own trip to the beach or any new place. Size: 10 7/8" x 12"